Employees in Garver's Frisco, Texas office joined together to help package meals for malnourished children around the world. Garver employees and their families packed more than 26 boxes, which will provide over 5,600 meals and feed 15 children for a year. 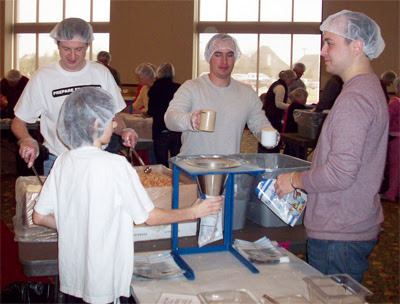 The volunteers worked with Feed My Starving Children, which is a Christian nonprofit hunger relief organization. Garver participants included James Henderson, Brandon Beville, Colin Bible, Perry Havenar, Camille Keene, Mitchell McAnally, Brandon Nelsen, and Frank McIllwain. FMSC delivers food to children in nearly 70 countries, and the boxes are distributed to orphanages, schools, clinics, refugee camps, nutrition programs, and more. The recent food-packing event in Frisco aimed to box 100,000 meals over three shifts. By the end of the day, 440 volunteers had packed 101,488 meals, which can feed 279 children for a year.